The woman seated in an armchair is a main subject in Picasso's work. The identity of this somber, full-length figure is beyond doubt: it is Jacqueline - depicted not only full face but in profile as well - who seems to be regarding us with a mixture of gravity and tranquility. This picture clearly exemplifies the move between portraits proper and the female figure paintings which Picasso supported over immaculate resemblances for long stretches at once. On the off chance that Olga had spoken to formality, figuratively speaking, and if Marie-Therese had typified delicate gentility and youth pretty much as Fran-coise exemplified pie de vivre, then the stage commanded by Jacqueline may be viewed as typical of balance and adult reflection. Not at all like numerous twentieth-century painters, Picasso never worked with expert models. Reliable in his preference for painting whichever lady he happened to be existing with and in adoration with,1 he attempted to grasp her inward being and encapsulate it in his portraits. Picasso initially met Jacqueline Roque in the late spring of 1953. From there on she shows up in his work over and over, some of the time unequivocally individualized however significantly all the more frequently in unique structure. 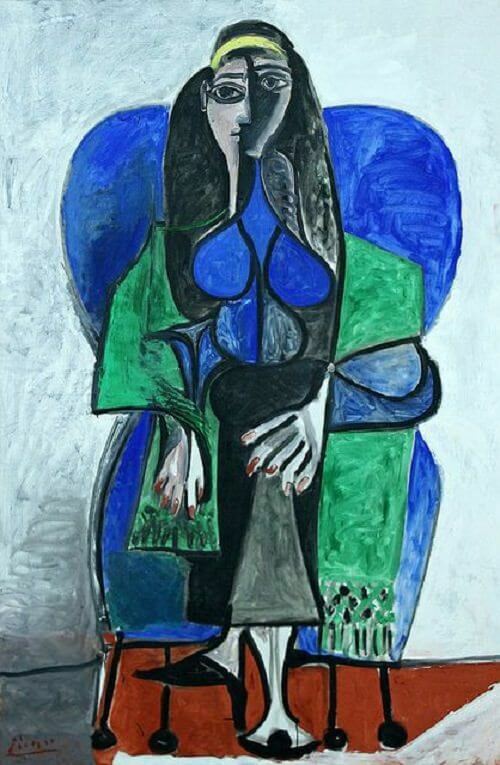 Any questions as to her character are dispersed less by facial qualities than by certain attributes.2 Picasso at first jumped at the chance to portray her situated in the old armchair that remained in his studio, however from 1960 onwards he favored the blue easy chair which structures a characteristic of the figure in Seated Woman with Green Shawl. The yellow headband encasing the dull hair is an alternate gimmick demonstrative of Jacqueline. Any individual who knew her or sees photos of her today will relate the red-lacquered fingernails more with her than with whatever other lady in Picasso's life.